September 25, 2013 March 9, 2018 Categories Family, WorkBerlusconi, Business, Education in Italy, Italian Women, Italy, Woman Owned Business, Women1 Comment on The Berlusconi effect and Italian Women. Ladies, get your act together. Before we get into this post, let me state a few ground rules. I am not a feminist. I grew up in a home with a father who worked and a mother who stayed at home early in my childhood. All the traditional fixings of an Italian father, and an American mother. But that all changed when my father decided to go into business himself. He looked to his wife, his partner, as his right hand person to make their business successful. And it was. Together my Italian father and American mother made an amazing family, a thriving business, and a happy fruitful life. That was the “traditional” Italian non-feminist upbringing I had growing up. My father cooked, and taught my mother how. They worked together to build a life, raise a family, and make decisions. But apparently this experience is in stark contrast to the typical experience young women in Italy have today. I understood this as part of what is “traditional” within the old country and things evolving slowly. But it became much more clear to me, after hearing a troubling story on the radio this weekend. Throughout my life, I’ve been surrounded by successful women who have juggled both their families and a career. My mother is an incredibly smart businesswoman who was a trendsetter and newsmaker as a small business owner. My Aunt was one of the first women on the west coast to own a restaurant chain. My Grandmother was one of the most respected women in her community, honored for her service to the Catholic community as well as her service to the clergy who served that faith. Being a woman in my experience has never been a deterrent, but instead a badge of honor. I continue to realize that honor as recently as last week when Rational, the company I founded, made the list of top 50 woman owned businesses in Washington State. 1. Only 10% of the Italian population graduates from college. And of this very small percent, women are a fraction. 2. Women are asked to submit their picture and “Personalità” profile with their college application to ensure their “bella presenza” or beautiful presence. 3. The top TV shows in Italy today are beauty pageant focused reality shows developed to showcase only the physically beautiful girls. Mothers across the country are on a mission to have their daughters “featured” on these shows. 4. If daughters want to go to college or work, it is seen as a failure and black mark on a father’s life to have not provided a situation for his daughter to not to have to go to school or work. 5. The merits of a woman’s contribution to her family, her society, is still seen in terms of what she contributes to her household and her husband rather than what she contributes to society overall. 6. Italy ranks 74th, below Malta and Greece, on gender equality, dragged down by its low score for women’s economic participation and opportunity, according to the World Economic Forum’s 2011 Global Gender Gap Report. 7. Roughly one in three mothers in Italy leave work to look after their families, according to a study by statistics office ISTAT. The maternal employment rate falls as children get older, while in other European countries mothers’ working rates recover as children grow up. Traditional views about the division of domestic duties all contribute to the trend. Italy, at least in my opinion, is one of the most advanced and progressive countries in the world. How is it that this country that I love so much is so far behind modern society where women’s basic contribution and rights are concerned? 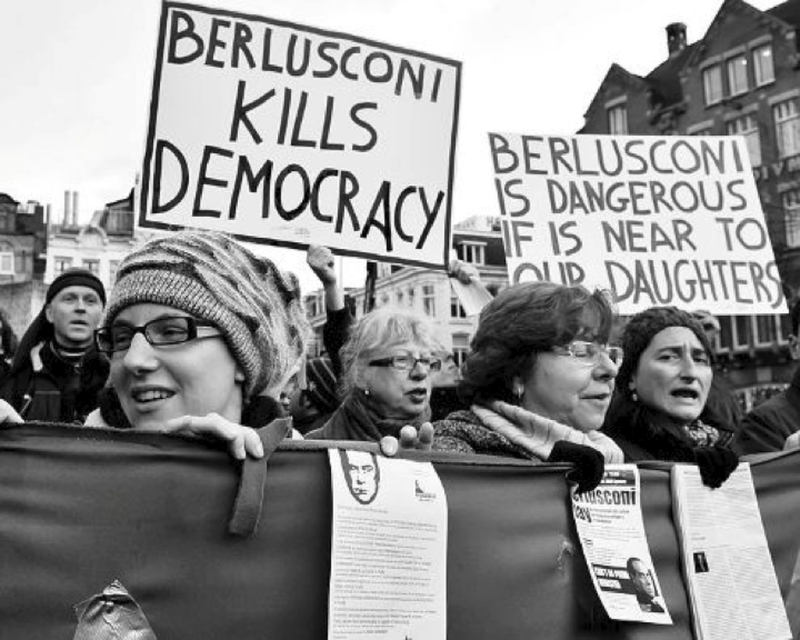 Many are calling it the Berlusconi effect. His influence was definitely a cultural barrier and deterrent to women’s progress between 1994 and 2011, the years he was in office. With allegations including sexual scandal, manipulation of the media, mafia ties, offensive jokes and comments about women and religion, he was hardly a leader working towards equality on any front. Italian women have all the gifts, the passion, the smarts to really make a difference in their own society and the world. While I certainly don’t have all the answers, I will spend much more time researching, studying, and learning more about who is trying to change this trend. There are some brave women trying to influence the culture in the direction of supporting women as equal partners. And with Berlusconi now out, and Letta now in, perhaps new leadership will bring change. The world will be a better place when we can achieve this equality. The gap is closing in countries like the Unites States, but apparently is wide and far in the sweet spot in my heart, Italy. There is a lot, for me personally, to consider. Particularly as I watch, nurture and encourage my own daughter as she begins to make decisions about high school, college and choices that will chart her life course. Thankfully she lives within an environment and a country where she will be able to make those decisions based on the merit of her efforts rather than how she looks, or her gender. Next Post Gender equality is the right thing to do, and it’s good for business.